Oregon State University has specialists available for a variety of subjects, and one of its areas of expertise is irrigation. Each Extension agent brings their own focus, from irrigating wine grapes to the policies that surround irrigation. 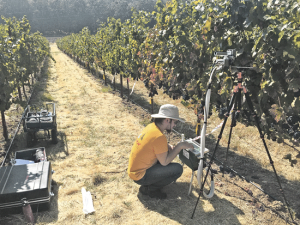 Alexander Levin, viticulturist and assistant professor in OSU’s Department of Horticulture, got into the industry initially to be a wine maker. During an internship, he became more interested in the vineyard aspects, and in 2012 he went back to school where he had an irrigation project. 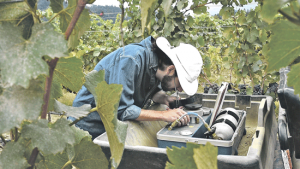 He said that irrigation is a critical part of the winery business, especially in the Willamette Valley, but farmers may not need to apply 100 percent of the water they think they need. The biggest difference between irrigated field crops and grapes is there’s a discontinuous canopy with grapes. Instead of a lawn where the entire surface area is covered by leaves, in vineyards it is only narrow lines that are covered. When it comes to when and how much to irrigate, he said farmers are still relying on visual symptoms because it’s the cheapest and easiest way. Instead, he recommends using an integrated irrigation water management process to keep grapes correctly hydrated. This includes scientific methods like water budgeting, measuring soil moisture and using plant-based methods. Water budgeting is similar to balancing a checkbook, where the amount of water to be applied is calculated as the balance between the amount of water held in the soil profile in the rooting zone and the estimated amount of water used by the crop over a given period of time. Estimates of crop water use can be made from local or regional weather data and crop growth stage or canopy size. Levin said although he is a big proponent of using plant-based methods because they’re the biggest indicators, the more scientific the strategy gets, the more labor intensive and costly. However, Levin found that many farmers prefer the scientific-based tools to actively checking their plants and he specified that even while using scientific methods it’s still important to look at the plant and assess its needs that way as well. “[Farmers] want someone to tell them when to turn the water on and for how long, but it’s not that simple,” he said. The economic policy behind irrigation also isn’t simple, according to Bill Jaeger, who teaches applied economics with a policy orientation at OSU. He came to Oregon in 2001 during the Klamath water crisis when irrigation was shut off and from there became more interested in water issues. For his research in the Klamath Basin, he found that if the farmers had had a market where they could sell, buy or lease water among themselves it would have been possible to reduce the impact of the water shortage shut off for irrigation. “You look and see if there were a change of rules and regulations, there are ways that allocation of a resource would make people better off,” he said. At the moment, Jaeger is working on a project in collaboration with the U.S. Geological Service to build a computer model in the Malheur Area of Oregon where there is a serious lack of groundwater. He wants to help find a more sustainable trajectory that would lead to the least amount of trauma and impact on farmers. At the end of the day, the choice to irrigate is an economic decision with costs and benefits. Levin also added that he can’t make the decision for the farmer what the best method is to help them. His advice, however, is to create an irrigation plan and stick with it.